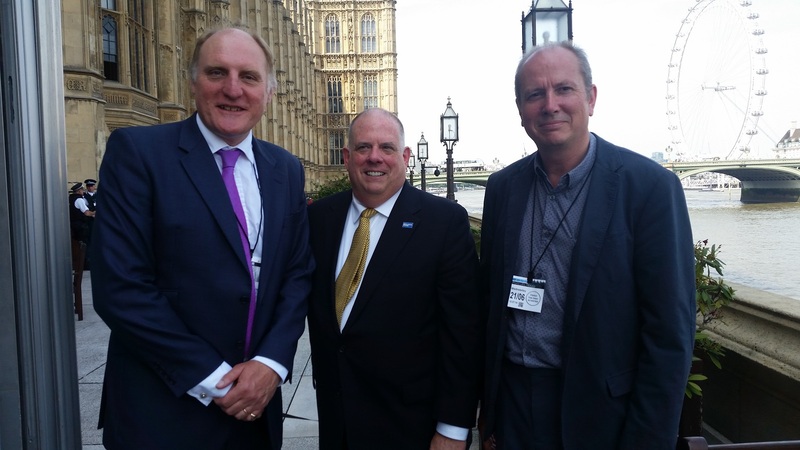 On 21st June 2017, Professor Keith Mayes, Director of the Information Security Group (ISG) at Royal Holloway University of London (RHUL) had the privilege of meeting the Governor of Maryland, Larry Hogan, when he came to the UK to promote collaboration, trade and investment, during a visit supported by the APPG on Cyber Security. The Governor was accompanied by senior officials from his Maryland office, as well as Professor Anupam Joshi, the Director of the Center for Cybersecurity at the University of Maryland Baltimore County (UMBC). There was a stimulating discussion around trade and innovation, which also included encouragement for RHUL and UMBC to increase academic collaboration for the benefit of the institutions, as well as shared local, national and international goals. "It was a great honour to meet the Governor of Maryland and his team, and to discuss opportunities for collaboration underpinned by shared values and goals. I am sure that the visit will have sparked some significant commercial opportunities, and Professor Joshi and I will certainly be exploring further academic collaboration during the coming year." The National Cyber Security Centre (NCSC) has issued guidance for political parties and their staff about how to detect "phishing" attacks. Read more: Phishing: guidance for political parties and their staff. The first joint report by the new National Cyber Security Centre (NCSC) and the National Crime Agency (NCA) has been published. It states that the cyber threat to UK business is "significant and growing". Intelligence Community Assessment (ICA) of Russian activities in the US Elections - a declassified version of a highly classified assessment. An article by Mattathias Schwartz about emailing hacking. The government’s strategy for tackling and managing cyber threats in our country has been announced. The National Cyber Security Strategy 2016-2021: Full Report. A report by the G7 Cyber Expert Group describes fundamental principles that can be used as guidance when creating cyber security strategy and policies in finance as they face increasingly sophisticated cyber threats. Flick Drummond MP writes about the first speaker meeting of the All Party Parliamentary Group on Cyber Security. The discussions focussed on security challenges facing an increasingly connected world such as data privacy and ownership in the cloud. Also, worrying cyber security problems exist in the Internet of Things, where the connection of cyber and physical systems mean cyber attacks may not just affect privacy or money but potentially cause serious damage and injury. The National Crime Agency (NCA) published their Cyber Crime Assessment 2016, describing threats to UK businesses from cyber crime. This report was produced jointly by the NCA and industry partners. It calls for more collaborative working between government, law enforcement and business to tackle cyber crime. Businesses are urged to view cyber crime as a board-level responsibility, not just a technical one, and to share intelligence with law enforcement and each other. The National Cyber Security Centre (NCSC) is intended to bring the UK's cyber expertise together and provide an authoritative voice on information security in the UK, as part of the government’s new cyber security strategy. The prospectus "explains the vision for the National Cyber Security Centre (NCSC) and how it intends to transform cyber security in the UK." Britain’s businesses are being urged to better protect themselves from cyber criminals after government research into cyber security found two thirds of large businesses experienced a cyber breach or attack in the past year. The research also shows that in some cases the cost of cyber breaches and attacks to business reached millions, but the most common attacks detected involved viruses, spyware or malware that could have been prevented using the Government’s Cyber Essentials scheme.